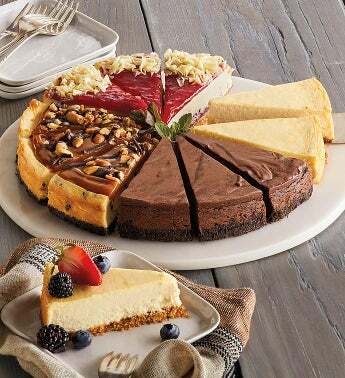 This cheesecake sampler is the perfect way to enjoy four delightful varieties of a classic dessert. New York-style cheesecake is a delicious favorite; chocolate caramel nut features ribbons of sweet caramel, crunchy nuts, and chocolate drizzle; chocolate marble is a chocolate lover's dream; and luscious strawberry adds a delightfully fruity balance. Send as a gift to celebrate special occasions, or just to share something sweet. And be sure to order one for yourself for entertaining or as a perfect finish to any meal.